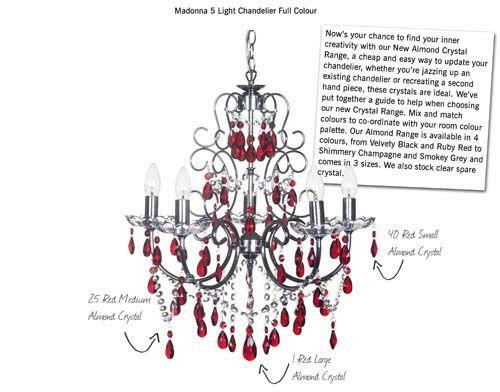 Bored of the same clear crystal chandelier? Fancy something a little bit different for the Festive Season? 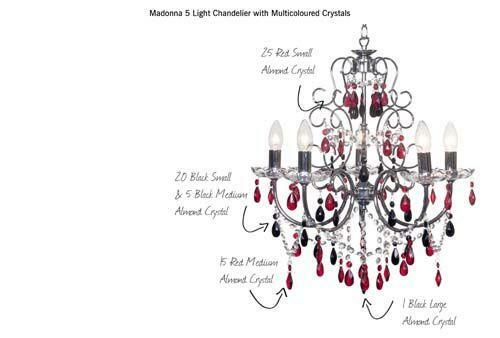 Stand out from the crowd with our Almond Crystal range, it’s a cheap and easy way to update your chandelier, whether you’re jazzing up an existing chandelier or recreating a second hand piece, these crystals are ideal. 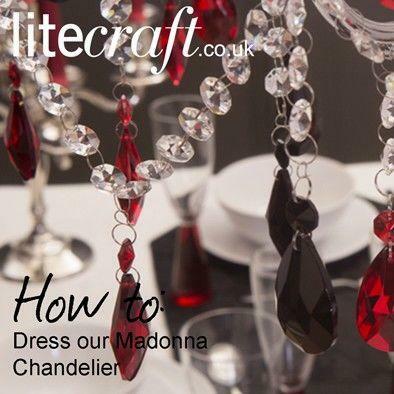 Coloured crystals diffuse light to create a sense of warmth and promote a cosy glow in the room and help give an existing chandelier some new life. Mix and match colours to co-ordinate with your room’s colour palette. Available in 5 colours from Smoke Grey and Deep Red to Black and Champagne. 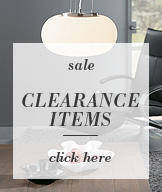 For spare crystal we also stock clear. For understated elegance sometimes one simple coloured crystal is enough to create a subtle effect. This range is also available in 3 sizes – small, medium and large. If you’re replacing a whole set of crystals you will need to calculate how many crystals you will need. If you’re updating a Litecraft fitting speak to our Customer Services team for help, we can check the full amount needed for all our fittings. 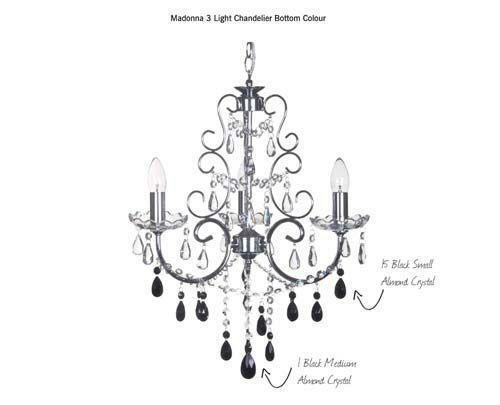 Some chandeliers feature a bobeche or sconce; this is a crystal or glass collar that fits around each bulb. These are usually designed with small pin holes for attaching crystals, count the number of holes per bobeche then multiply this by the number of arms on your fitting; this will give you the number of crystals required. 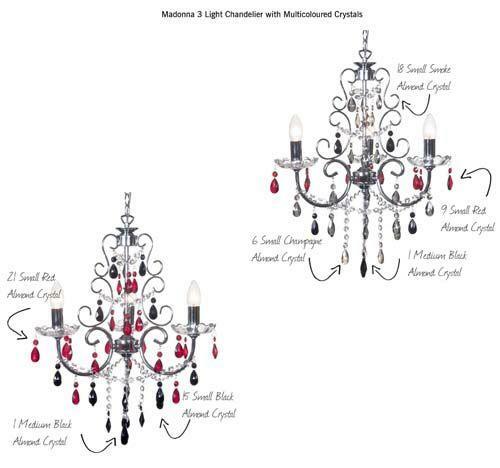 Take into account, some chandeliers also feature extra crystal drops along the arms and also on the tips of each arm. 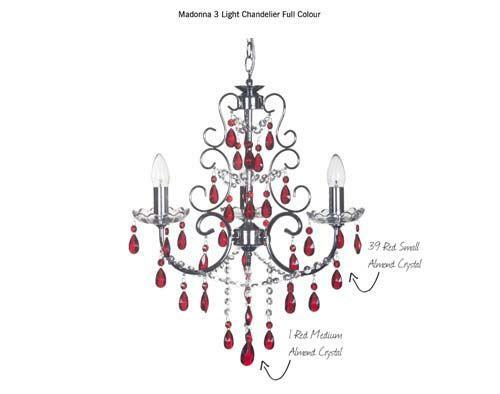 There will be a clearly marked pin hole for each crystal, use the crystal loop or clip to attach to the chandelier. There are a few simple steps to ensure your chandelier stays glistening, the wonder of a chandelier can be easily tainted with grime and dust, regular maintenance will ensure your chandelier stays glistening for longer. To start with, switch off your chandelier at the mains; you will need an extra source of light to illuminate your chandelier whilst cleaning. 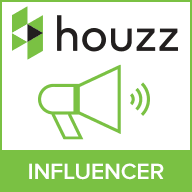 A step ladder will be needed for flush fittings and high ceilings. Put down an old sheet to collect any drips and cover all bulbs with small plastic bags. 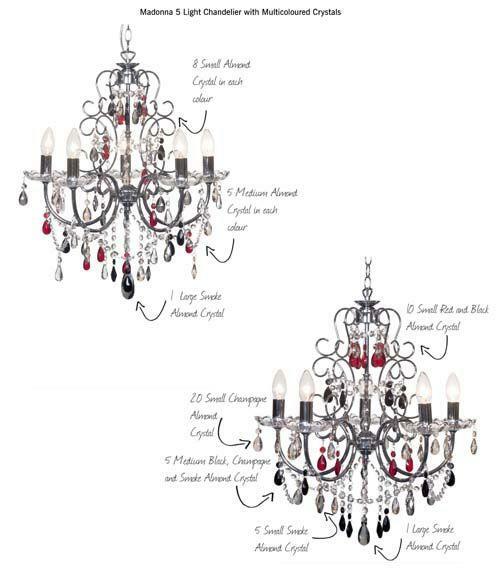 Using your crystal and chandelier cleaning spray, spray generously 10 to 12 inches from the fitting, try to avoid any wires and cables and spray completely until the fitting is wet and dripping freely. 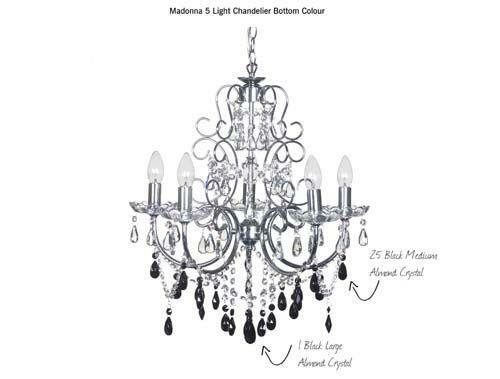 Depending on the state of the chandelier, you can either let the fitting drip dry or for older fittings an individual clean of all the crystals will be needed. Make sure to check for any residue, flat or cupped surfaces will sometimes collect excess cleaning fluid so use a soft cloth dipped in the spray to wipe down any excess. 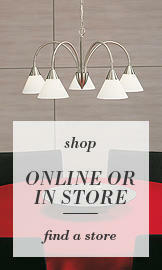 Allow your chandelier to dry completely overnight before switching the power back on. A few sprays every month will keep your chandelier looking new and sparkly.